Why should we be your one-stop language provider? 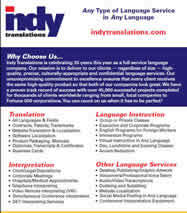 At Indy Translations we pride ourselves in consistently providing professional, high-quality language services that meet our clients' global demands. Please follow the link below to learn more about our high-quality and cost-effective language services for ANY language need.